Watch: Tom Sinclair on the evolution of executive search. 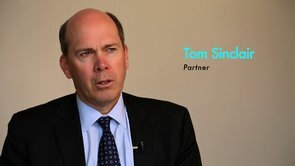 Tom was previously a Founding Partner of a boutique executive search firm in Toronto and a Senior Vice President in the Toronto Executive Search Practice of PricewaterhouseCoopers. Prior to executive search, Tom held senior roles in corporate restructuring, finance and operations and was also the Director of Human Resources for the GTA offices of Coopers & Lybrand. Tom has consulted to a wide range of private and public sector organizations covering a variety of senior management and executive positions. Clients have included start-up technology companies through to multi-nationals, manufacturing, retail, services, natural resources, professional services firms, municipal and provincial governments, health, education and not-for-profit organizations. Tom has extensive experience in the recruitment of financial leaders, in particular finance and accounting professionals. Tom’s educational background includes a Bachelor of Commerce degree from the University of Toronto and Chartered Accountant and Certified Management Consultant designations. Tom has also completed the Governance Essentials Program through the Institute of Corporate Directors.